Join us in congratulating Safair, AirBaltic and Minsk International Airport which have achieved the prestigious 5 star status for punctuality as part of a new accreditation programme launched today by OAG. The October edition of OAG’s 5-star programme recognises and celebrates on-time performance excellence for airports and airlines, regardless of size of geography using an industry led benchmark devised by OAG, the flight information experts. Awarded twice a year in April and October, and based on 12 months of rolling data, this is the ultimate, inclusive, globally recognised accreditation for any airline or airport. 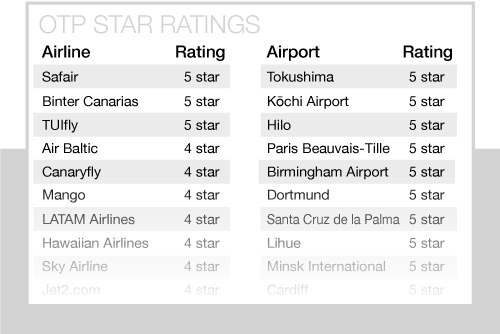 See where others ranked in our full ratings. This programme gives airlines and airports an official badge that will give passengers confidence in their brand, recognises team efforts and gives the industry consistent on-time performance KPIs (key performance indicators) on which to base their aspirations. View the full results and find out more about the programme.